Dandy is a 12 year old gelding that presented with an acute left hind lameness. This lameness was localized to the hock and stifle. 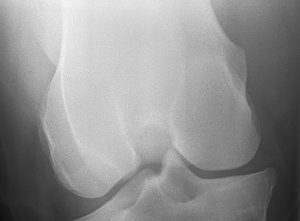 Radiographs and ultrasound showed only mild joint abnormalities. Joint injections, shockwave therapy, acupuncture, and rehab exercises were done over the first 30 days after the lameness was detected. Patient improved in pain, mobility, and comfort from the initial period and went back to work shortly after that. 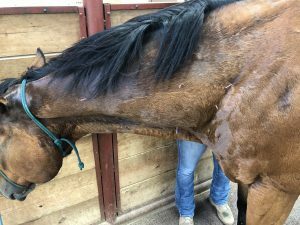 Dandy is a 12 year old Appendix Quarter Horse Gelding that presented for a predominant left hind lameness in summer of 2018 for 2 weeks duration. He lives at the CSU Equine Research and Teaching Center as a program teaching horse. Additionally, he is shown locally around Colorado as a jumper during the summer months. Dandy was bright and alert on presentation. Vital parameters were within normal limits. His body condition score was a 4.5/9. Musculoskeletal exam was performed next. 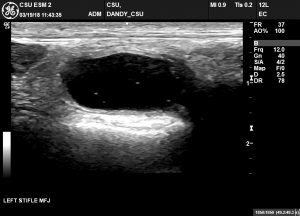 There was poor muscling of epaxial muscles down the topline, mild osseous swelling on dorsal aspect of left carpus, moderate epaxial muscle pain spanning from T16-L4, and mild fetlock and digital tendon sheath effusion in both right and left hind. 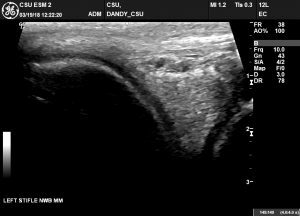 The left femorotibial joint also contained effusion and joint capsule thickening. Myofascial exam showed mild sensitivity to the left brachycephalicus muscle. Spinalis muscle and longissimus muscle were mild to moderately sensitive to palpation along thoracolumbar spine (as mentioned above). Movement and range of motion of both fore limbs and cervical area was within normal limits. Leg circles and psoas muscle testing was within normal limits. The left tuber coxae was consistently held lower than the right throughout all gaits and at rest. Decreased dorso-­‐ventral excursion was noted through T18 – L4. Because he is lame in the left hind and more positive to full limb flexion, left hind distal hocks joints were blocked to localize the lameness. 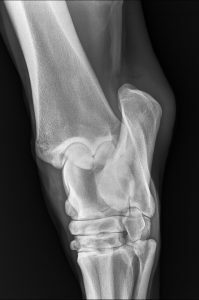 He improved 70% to an intra-articular block to the tarsometatarsal and distal intertarsal joints. 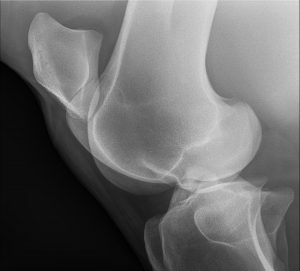 Further, the left medial femorotibial joint was blocked with an additional 20% improvement in the lameness. 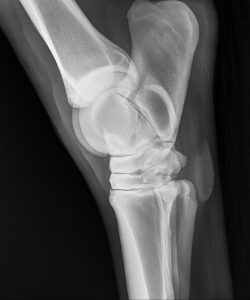 Radiographs were taken of the left hock and stifle. 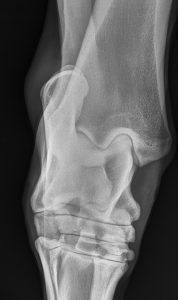 The stifle has no osseus abnormalities while the hock had very mild osteoarthritic changes in the tarsometatarsal joint. These radiographs are attached. 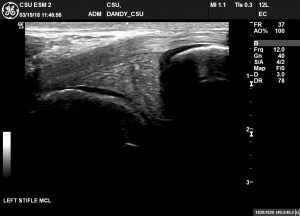 An ultrasound was done of the left stifle that showed hyperechoic debris was found in the medial femorotibial joint indicating mild synovitis and joint capsule thickening. All soft tissue structures were within normal limits. 1. Left distal intertarsal, tarsometatarsal, and medial femorotibial joint injections – 6mg Triamcinolone and 22mg hyaluronic acid into each joint. These joints both showed abnormalities on flexion tests and diagnostic imaging therefore intra-articular medication was needed for control of inflammation and pain. 2. Extracorpeal shockwave therapy – Lumbo-­‐sacral area to aid in relieving muscle tension by providing analgesia and increasing blood flow to the area of concern. 3. Acupuncture (3 sessions) starting one week after the injections including two sessions of electrical stimulation. 4. Physical therapy with core and stifle building exercises (tail pulls, sternal lifts, and pelvic tucks) to be done 3-4 times per week for the first 30 days. Exercises to stretch and strengthen the stifle was also done during the initial 30 day period. When he was introduced back to work after the initial 30 days, work was focused on long trotting, trotting over poles, backing, trotting up and down hills for 3-4 days per week for an additional 30 days. Session 2 and 3 incorporated electrical stimulation from LI 18-LI 16, BL 18-BL 28, and ST 36 to BL 40 for 10 minutes. Electrostimulator – Ito ES-130 was purchased shortly after the course and used on this case. Each of three leads were used as described above between frequency setting 2 and 3 on the dials. Frequency selection was based on what was taught in the course in finding a setting that allowed electrical current but not muscle twitching. The above points were selected as they were either discussed in the modules, during the lab session of the course, or from the handbook that we received from the course. All needles that were used on this horse were 0.25 x 40 needles made by Seirin. We were encouraged with his improvement in the left hind lameness after the 30-day therapeutic period. The left hind lameness improved from 3/5 to barely noticeable at the walk and trot on multiple surfaces. This case included multiple modalities; therefore, it is hard to assess the direct impact the acupuncture alone had on this case. I want to think the acupuncture helped with muscle soreness and mobility along with other modalities. No adverse events were appreciated with any of the therapeutic modalities. I have been practicing veterinary medicine for the past 11 years. With the addition of acupuncture as a tool for my patients over the past couple months; I have been able to better treat pain from multiple directions with acupuncture, which has allowed my patients to improve significantly faster with more mobility and comfort. 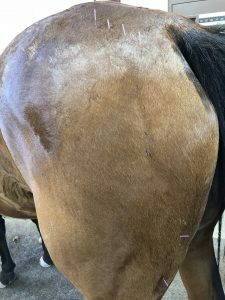 I believe the hock and stifle injections treated the inflamed joints while the shockwave therapy and acupuncture seemed to improve his muscle soreness and back pain. The rehabilitation exercises that were selected have been used on multiple horses in our practice over the past 4-5 years with success. Asking a patient with back to strengthen themselves using basic stretching and muscle building allows the core muscles to support the back during weight bearing and exercise. Additionally, asking them to build the musculature around the stifle supports those joints in a way that helps increase performance and endurance. I feel I am better equipped now with acupuncture to treat multitude of musculoskeletal conditions such as secondary back and neck pain due to primary joint pain as was seen in this case. 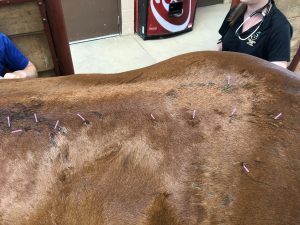 In doing a quick literature search, I cannot find a project where acupuncture and core building exercises were used together to treat horses with back and neck pain. This area is overlooked due to the pressures of training within the equine industry and lack of education on the effectiveness of these modalities.